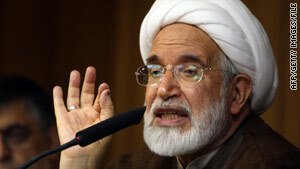 Opposition leader Mehdi Karrubi says, "Iranian society has made strides in the path of knowing their rights." Karrubi: "History shows that obtaining freedom and rights is never without a cost"
Karrubi says, "My biggest concern is the violent crackdown against people"
Editor's note: Opposition leader Mehdi Karrubi is a former Iranian Parliament speaker and ran for Iran's president as a reform candidate. He and others have accused the government of widespread fraud in last year's election. (CNN) -- Iran's disputed presidential election last year sparked widespread outrage within the Islamic republic and gave rise to the Green Movement, led by opposition candidates Mir Hossein Moussavi and Mehdi Karrubi. Protesters took to the streets in defiance of the hard-line regime led by President Mahmoud Ahmadinejad. But the government cracked down on protesters and has steadily been tightening its grip throughout the year, according to human rights activists. Karrubi responded to CNN's questions on the first anniversary of the disputed vote. CNN e-mailed the questions to Karrubi's son, Mohammad Taghi Karrubi, and he returned his father's answers. CNN: How is Iran different today as compared to before last year's elections? Mehdi Karrubi: Last year the elections started with excitement and joy, and most people came forward because they wanted change. We saw the political maturity of different levels of society and people supported their candidates faithfully. But after unprecedented fraud in the elections, we witnessed the peaceful protest of the people who wanted to take back their vote. Unfortunately the government's blatant and merciless crackdown cost the people a lot. Today many in Iran have lost their loved ones just because they questioned the result of the vote. Many others were injured and many political activists and the children of this country filled the prisons. Security forces have trampled on constitutional laws, criminal laws and civil laws. CNN: Is the situation in Iran better today than it was last year? Karrubi: This can seen be seen from two viewpoints. From the way things appear, things have not improved because the political situation, the economy and international relations have been damaged. Iranians have paid a heavy price. But if we take a deeper look at the situation, the Iranian society has made strides in the path of knowing their rights, and this is a great achievement. CNN: Many people were killed and arrested during the protests. Was the movement worth it? Karrubi: It's a difficult situation but I have to say there is a heavy cost if you want to reform a system that's approaching corruption, ignoring the goals of the revolution, constitutional rights and the blood of our martyrs. From this viewpoint, despite the bitterness, this cost is understandable. History shows that obtaining freedom and rights is never without a cost, even with movements that are completely peaceful. CNN: Why have the street protests stopped? Karrubi: People have stopped taking part in demonstrations because of the brutal repression in the streets, the huge number of unjust arrests and inhumane behavior in prisons, and the creation [of] a police state, but this does not mean we will forget about our demands. CNN: Is the Green Movement stronger than it was one year ago or weaker? Karrubi: The Green Movement today is stronger and more mature than last year. Despite a heavy climate of repression, this movement has been able to unite and spread to different layers of society. Incidentally, the (Iranian) leadership understands this important development very well. The fact that funeral processions take place with the presence of anti-riot police and the fact that they never grant permission for any gatherings, even to honor Imam Khomeini, shows the strength of this movement and their fear of this movement. CNN: What does the Green Movement want today? What is its goal? Karrubi: This movement wants the execution of all the principles of the constitution, especially those related to the rights of the Iranian people. This movement wants Iran to grow under the reform movement and for the law to become reality for everyone. It wants fundamental civil rights for everyone. These are the goals of this movement. CNN: How does the Green Movement hope to achieve its goal? Karrubi: From reform and the return to the original path of the revolution and constitutional rights. Don't forget Iran's Green Movement is only after achieving its goals by raising awareness about people's rights through a peaceful and least costly path. CNN: Do you consider Mr. Ahmadinejad your president? Karrubi: No. Like I've repeatedly said, I consider him the head of the current government. CNN: Do you fear for your safety? Karrubi: There are many concerns but I'm not afraid. During the past year my family and I have endured a lot of pressure. From a bullet shot at my car in Ghazvin to an attack on my home. My biggest concern is the violent crackdown against people, especially the young men and women in the streets and prisons. I know that there's been a departure from the path of law and the path of the Imam, and I know change will not come easy. I see the defense of people's rights as my duty and I'm willing to do it at any cost. CNN: What gives you hope that the Green Movement will succeed? Karrubi: The strength of this movement is the participation of diverse layers of society. The key to the success of this movement is the awareness of the people, especially the youth and the women who are in the forefront of this movement, and the determination of people to go after their rights. The true leaders of this movement are the people, not us. There are hard days ahead but the path is clear and the future belongs to the people.